Latkes, also known as potato pancakes, are a traditional Jewish favorite. Our recipe, based on our own Bubbe's recipe, is simple and authentic. We've fried them to a beautiful golden brown and packaged them by the half dozen for you, ready to lightly pan fry or bake in the oven. Latkes, 6 ct. has been added successfully to your wishlist. 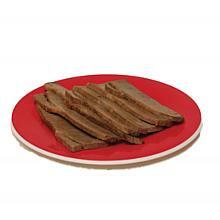 As a kid, these were your Hanukkah favorite. You just couldn't wait for your mishpocha to gather to light the candles on the menorah and enjoy a feast that included these special potato pancakes. Out of love, Bubbe spent so much time grating the potatoes and adding her own special seasonings before pan frying them to a beautiful golden brown for your family celebration. And as a grown up, you know that latkes are for more than just your Hanukkah gathering. Latkes have earned their rightful place as a tempting side dish with almost any meal, or even a filling snack, especially when topped with applesauce or sour cream. And now, Schmaltz has done all the work for you. Our recipe, adapted from our own Bubbe, stands the test of time. Our homemade latkes start with fresh potatoes, then we add simple seasonings and a little matzo meal to bring you the taste you remember. Be sure to get a few extra for Uncle Eli. You know he loves latkes with extra applesauce. There are currently no reviews for Latkes, 6 ct., but you can be the first! 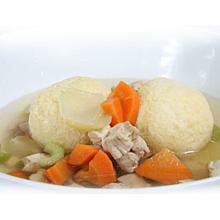 Chicken Soup - Matzo Ball, 1 qt. Schmaltz's famous chicken soup is made fresh daily with chicken, onions, carrots and other seasonings and 2 floater matzo balls. Schmaltz matzo balls are perfect for adding to homemade soup or for when you have some extra guests coming over for dinner.